The Council recently recognized Tommy Hamamoto for 10 years of service. 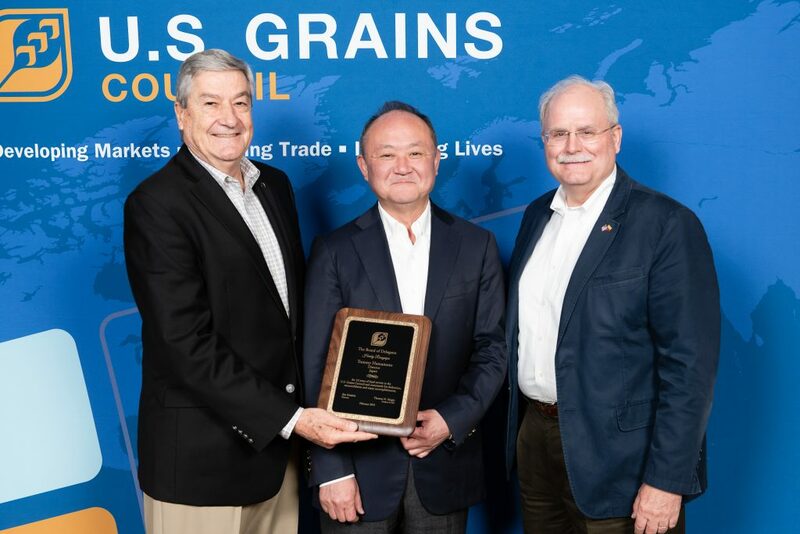 U.S. Grains Council (USGC) Director in Japan Tommy Hamamoto has exemplified how consistency – and versatility – are needed to develop long-term and lasting markets throughout his tenure working on behalf of U.S. farmers and agribusinesses. The Council recognized Hamamoto for 10 years of service during the organization’s 16th International Marketing Conference and 59th Annual Membership Meeting earlier this year. A wet lab biochemist by training, Hamamoto had worked with the Council in Japan, mainly on biotechnology regulations, before joining the organization as the country director. “As I had worked with cooperators as a local specialist with the U.S. Department of Agriculture’s Foreign Agricultural Service (USDA’s FAS), I always saw their jobs as a bridge between U.S. suppliers and Japanese users,” Hamamoto said. Once he joined the organization, Hamamoto realized he still had much to learn despite his familiarity with the Council. A decade later, he is an expert in promoting U.S. feed grains and co-products to one of the largest U.S. trading partners. Hamamoto took on the challenge of promoting U.S. ethanol in 2015, working with a completely different set of stakeholders with whom he was unfamiliar. However, he successfully adapted and played a pivotal role as the Council worked with the Japanese government as they revised biofuels policy, opening the door to imports of ETBE (ethyl tert-butyl ether) produced from U.S. corn-based ethanol. Hamamoto has also spearheaded food sorghum and food barley promotional efforts in Japan, successes he said he will never forget. His staff nicknamed him Dr. Sorghum for his efforts. Throughout the years, Hamamoto said he has enjoyed working with his Council colleagues around the world as well as the farmer members that always have something to teach him.